AUSTIN, Texas — New research has found that wind carved massive mounds of more than a mile high on Mars over billions of years. Their location helps pin down when water on the Red Planet dried up during a global climate change event. The research was published in the journal Geophysical Research Letters, a journal of the American Geophysical Union, on March 31. The findings show the importance of wind in shaping the Martian landscape, a force that, on Earth, is overpowered by other processes, said lead author Mackenzie Day, a graduate student at The University of Texas at Austin Jackson School of Geosciences. 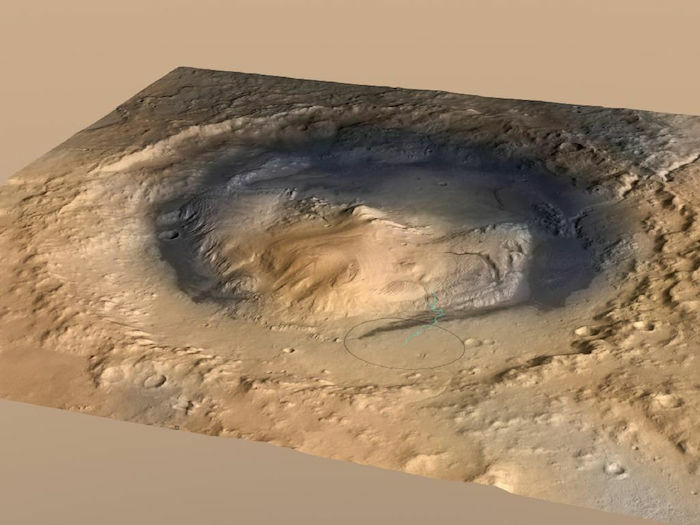 Gale Crater, the landing spot of NASA’s Curiosity Mars rover, has a three-mile-high mound at its center called Mount Sharp. The circle indicates the rover’s landing place. The blue line is its path. Day conducted the research with Jackson School researchers Gary Kocurek and David Mohrig of the Department of Geological Sciences and University of Texas at Dallas researcher William Anderson. First spotted during NASA’s Viking program in the 1970s, the mounds are at the bottom of craters. Recent analysis by the Mars rover Curiosity of Mount Sharp, a mound over three miles high inside Gale Crater, has revealed that the thickest ones are made of sedimentary rock, with bottoms made of sediments carried by water that used to flow into the crater and tops made of sediments deposited by wind. However, how the mounds formed inside craters that were once full of sediments was an open question. To test whether wind could create a mound, the researchers built a miniature crater 30 centimeters wide and 4 centimeters deep, filled it with damp sand, and placed it in a wind tunnel. They tracked the elevation and the distribution of sand in the crater until all of it had blown away. The model’s sediment was eroded into forms similar to those observed in Martian craters, forming a crescent-shaped moat that deepened and widened around the edges of the crater. Eventually all that was left of the sediment was a mound — which, in time, also eroded away. “We went from a filled crater layer cake to this mounded shape that we see today,” Day said. To understand the wind dynamics, researchers also built a computer model that simulated how the wind flowed through the crater at different stages of erosion. The mounds’ structure helps link their formation to climate change on Mars, Kocurek said, with the bottom being built during a wet time, and the top built and mound shaped in a dry time. A view from the lower flank of Mount Sharp, a sedimentary mound inside the Gale Crater on Mars. The research helped scientists home in on Mars’ Noachian period, a geologic era that began about 3.7 billion years ago, as the period when Mars started to change from a wet world to a dry one. Scientists were able to link the climate change to the Noachian by studying the location of more than 30 mounds and finding that sedimentary mounds were only present on terrain that was exposed during that period. The research was funded by NASA, the National Science Foundation and The University of Texas at Dallas.